The covers of the three albums released by the ten-piece instrumental ensemble the Budos Band depict a volcano, scorpion and cobra. In other words, objects that are fascinating, even mesmerizing, from afar, but deadly serious up close. Like those totems, the Budos Band’s music can be appreciated, but rarely trifled with. It is fitting, then, that the ensemble came together at the turn of the century during the Afro-beat revival lead by the New York-based combo Antibalas. 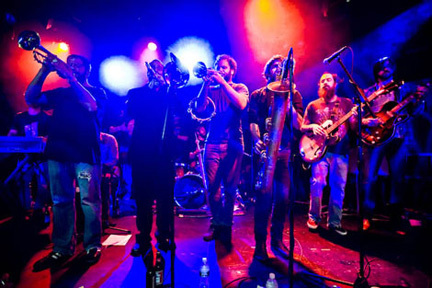 Although inspired by – and sharing musicians with – Antibalas, the Budos Band developed a distinct voice. While the band’s 2005 self-titled debut was a jumping off point from Afro-Beat to soul, Tankel said their second album – “Budos Band II,” released in 2007 – shows the emergence of Ethiopian jazz influences. That growth continues on this summer’s “Budos Band III.” The album’s darker and heavier undertones hint at the band’s rock and metal influences. Although the textures and arrangements vary, Budos Band songs come together in a pretty straightforward process. Guitarist Tom Brenneck or bass player Dan Foder come in with a rhythm bed, or Tankel and trumpet player Andrew Greene develop a melodic horn line. After the quartet refines the idea, it goes into rehearsal, where drummer Brian Profilio listens to the parts, suggests transitions and helps develop an arrangement. The song is then presented to the other half of the band – the percussion section. Just don’t expect that process to include a vocalist any time soon. Like every other album released on the Daptone label, all of the Budos Band’s output was recorded at the label’s House of Soul studio/headquarters in Brooklyn, N.Y. and produced by Gabriel Roth, aka Bosco Mann, leader of the Dap-Kings. As the band behind Amy Winehouse’s “Back to Black” and Daptone flagship artist Sharon Jones, the Dap-Kings have become a hot commodity. The true competitive spirit lies in the band’s roots with Antibalas. The groups’ shared musicians over the years have lead to a healthy level of one-upmanship.